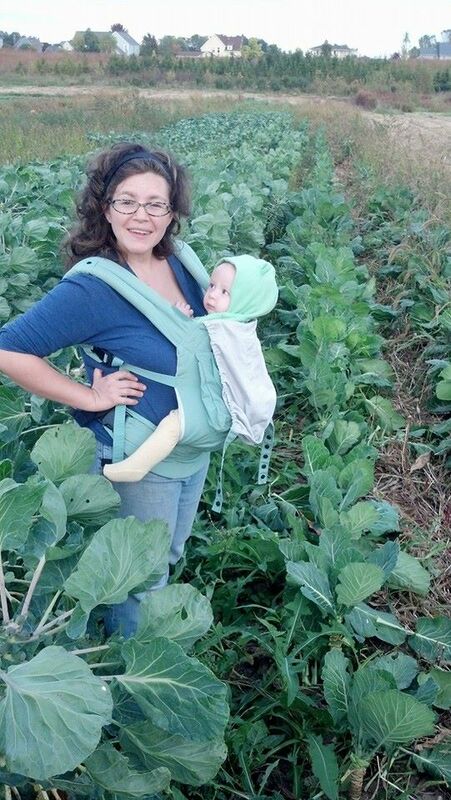 We are super excited about the brussels sprouts this year! I’m not sure whether I made an error in the greenhouse plan, or if someone got a little over-enthusiastic during the seeding, but we have a lot of them. Usually, brussels sprouts (and their relatives from the family Brassica, like kale, collards, turnip greens and cabbage) have a harder time of it than other crops. There are two pests that plague Brassicas: flea beetles and cabbage looper moths. Additionally, brussels sprouts are heavy feeders, and it can be challenging to time the planting right so that the sprouts mature early enough. There they are on the left! This year, however, circumstance and preparation came together to make for some great sprouts. First, Nick did a very nice job managing the fertility in the brussels sprouts field, so the plants got large and were healthy enough to resist pest damage. Then, the cool summer and plentiful rain helped the plants grow well, without being subject to heat stress. Overall, we are pleased with the results, and we hope you are too! If you’re not a traditional sprout fan, do give them another go! There are some good recipes from Lori at the end of the newsletter. On a different note, this coming week we will be saying goodbye to a few friends from the summer. Nick will be taking about half of our turkey flock to the processor tomorrow. Our hope has been to provide them with a life full of good days out in the field, and I think they have been very happy this year. We were happy to have them, and are glad to be offering turkeys for sale again this year. Information about ordering a turkey for Thanksgiving can be found here. Remove the tops of the turnips and radishes from the roots and store separately. Turnips, radishes and carrots can all store a long time – 3-4 weeks – if stored in a crisper drawer or plastic bag with a little ventilation. Sage can go in the fridge in a little baggie, or it can be hung upside down and dried -choose a warm, dark, and well ventilated area. Green tomatoes will keep best if stored in the fridge! Turnips and radishes are back, and they are very mild and delicious. I eat them raw, either by themselves or on crackers or toast, but they are also delicious when roasted or added to soups or stews (yes, radishes!). Do not toss those turnip tops! They are mild and delicious, just like their underground counterparts, and can be sauteed like chard or bok choi. They are also super nutritious! I linked to this article last year, but here are some inventive things to do with celery – including some ideas for how to include the leaves in recipes! Try this recipe from Mark Bittman for broccoli soup – using both florettes and stalks! Not sure what to do with sage? Click here for a recipe and storage tips for Browned Sage Butter. Lori found some more great recipes, especially for brussels sprouts. Put the vegetables and stock in a medium saucepan and bring to a boil. Cover and cook until the turnips are barely tender, about 10 minutes. Pour most of the liquid off, return pan to stove, and reduce the heat to medium. Add the butter and maple syrup. Stir to coat the vegetables and continue to cook uncovered until the vegetables are glazed and beginning to caramelize around the edges, about 2 minutes. Sprinkle Bacon Salt or bacon over vegetables, toss to coat, and serve. Prepping the brussel sprouts is the only time consuming part of the entire recipe. For those that may not have worked with brussel sprouts before, just cut off the end that was attached to the stalk, making sure to cut the stems of the outer most leaves. Those leaves should almost fall right off now. Cut the brussel sprout in half making sure to cut through the core so that it holds together. Cut the bacon in thirds and fry it in a medium heat pan. As a bacon press, I use some aluminum foil and a pot that is just smaller than the pan. It works great and costs nothing. If you want to be really efficient, don’t throw the foil away when you’re done with it, as you’ll need again in a bit. When the bacon is done, remove it but leave the fat behind. Add the olive oil to it with some salt and pepper. Place the brussel sprouts face down in the pan and cover the pan with the foil. Covering the pan with foil will trap the steam that is let off and cook the sprouts evenly. Turn the heat to medium-low and cook for 10-12 minutes. When the brussel sprouts are good and caramelized add the bacon back in to reheat. In a large pot of boiling salted water, cook the sprouts in batches until bright green, about 3-5 minutes per batch. Drain the Brussels sprouts and transfer them to a large bowl of ice water. When cool, remove the sprouts from the cold water, drain well, and cut them in half lengthwise. high heat until it is golden brown, about 2 minutes. Add the sprouts and increase the heat to high. Sauté until the Brussels sprouts are golden brown, about 5 minutes. Add thyme and honey, and mix well. Season to taste with salt. Transfer to a platter, cover with foil and repeat with remaining Brussels sprouts. Spoon the Brussels sprouts onto a large serving platter and serve immediately. Sprinkle both sides of the green tomato slices with salt and pepper. Whisk the milk, hot sauce, eggs and seasonings together. Set aside. Place 1/2 cup flour in a large bowl. Use the remaining 1/2 cup flour to mix with the cornmeal in another wide bowl. Season both flours with salt and pepper. Pour enough peanut oil in a black skillet to cover the bottom at most half and inch. Place one green tomato slice in the plain flour. Then place it in the egg mixture. Dredge the slice through the cornmeal and flour mixture. Place on a paper towel lined cookie sheet. Repeat with the other tomato slices. Working in batches, add two slices to the hot oil (be careful not to add too many slices to the pan, for the oil’s temperature will reduce). Fry green tomatoes until golden brown, about 2 to 5 minutes per side. Using a slotted spoon, transfer to a prepared baking sheet lined with paper towels; sprinkle with salt and pepper. Keep warm in oven. After all the tomato slices are fried, add dry sage leaves to the oil. Fry for a few seconds. Transfer to a paper towel lined plate. When serving the Fried Green Tomatoes, place Fried Sage leaves on top. Enjoy warm.